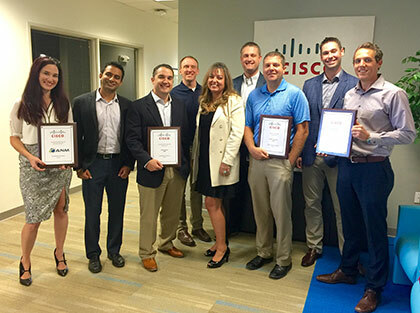 Pictured here at Cisco Awards Breakfast in Albuquerque from left to right: Patrice Vigil, Aman Arora, Vance Krier, Bart Goodman, Laura Tacker, Clayton smith (Cisco), Jeremy Stephens, Lee Loen (Cisco RM), and Colby Elliott. 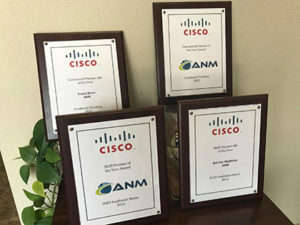 For the second year in a row ANM has been named Cisco’s Partner of the Year in New Mexico, ANM’s headquarters state. This prestigious award, announced earlier this week at Cisco’s Partner Breakfast in Albuquerque, on September 27, capped off ANM’s success in all award categories including: Commercial Partner of the Year, Public Sector Partner of the Year and individual awards for Vance Krier who was named the Cisco Commercial Partner Account Manager (AM) of the year and Jeremy Stephens who was named the Cisco SLED (State, Local and Education) Partner Account Manager of the year. Since its founding in Albuquerque, ANM has created a large engineering team that carries the highest levels of engineering expertise and certifications from each of its industry-leading manufacturer partners. Their sales and engineering branches in Las Cruces (NM), as well as Denver (CO), Golden (CO) and Colorado Spring (CO) provide additional resources for rapid response to client needs.